Preparations for one of Macon’s most highly anticipated social events are currently underway. 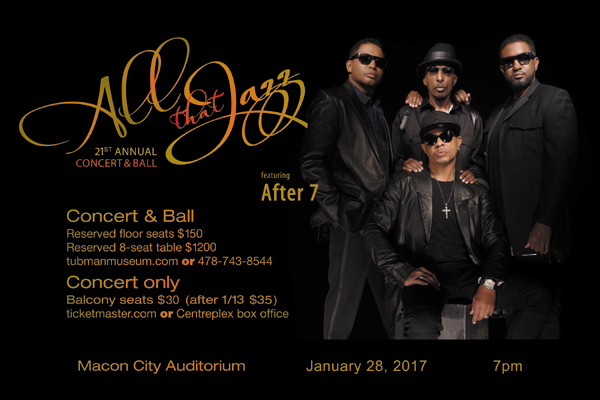 The 21st Annual All That Jazz Concert & Ball, the Tubman Museum’s signature, black-tie fundraiser returns to the Macon City Auditorium on Saturday, January 28, 2017. Sponsors and guests will enjoy an unforgettably elegant evening of wonderful live music by major recording artists and a special surprise guest, delicious gourmet cuisine of heavy hors d’oeuvres prepared by Kudzu Catering, and dancing during the elegantly festive atmosphere of All That Jazz. In celebration of the Tubman Museum’s 35th anniversary, the live concert during this year’s favorite social event of the season is being headlined by the sensational After 7, the R&B group consisting of brothers Melvin and Kevon Edmonds, Jason Edmonds and Keith Mitchell, who will entertain and delight all in attendance. The Edmonds brothers are the siblings of popular pop and R&B singer-songwriter-producer Kenneth “Babyface” Edmonds. Also, scheduled to perform on the stage during the evening is Avery Sunshine, a mercurial singer and composer who merges soul, gospel, jazz and R&B into a signature mix. A graduate of Spellman College, the talented singer has worked everywhere from Broadway to the Democratic National Convention to the European festivals and club scenes. Following dinner, the fun continues with an after-concert dance party hosted by Central Georgia’s best-loved disc jockey — AJ the DJ — who will spin amazing sounds from his extensive library of music. While entertaining the audience with the smooth recordings during the dance party, AJ will also mesmerize them with his customized, state-of-the-art light and video presentation. The Tubman Museum invites everyone to join us at its premier fundraising event – All That Jazz Concert & Ball – on Saturday, January 28, 2017 from 7:00 p.m. to midnight. Balcony tickets for the live concert only are available now at ticketmaster.com for $30 until January 13 (and $35 thereafter until sold out). Sponsor tables of eight on the floor at this very special event entitles the ticket holders to the live concert, PLUS the delectable catered meal and dancing during the after-concert party. All proceeds benefit the Tubman Museum educational programs. For more information about All That Jazz, visit the Tubman Museum’s web site at www.tubmanmuseum.com or call 478-743-8544.